Visit my blog for close up images. Includes: 14 count Antique Brown perforated paper, glass seed beads, beading needle, miniature clothespins and charted design with alphabet and complete finishing instructions. 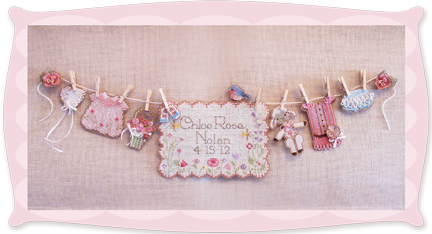 The pieces are individually stitched & beaded on perforated paper and mounted on the background of your choice. Finished dimensions are approximately 18" x 6". 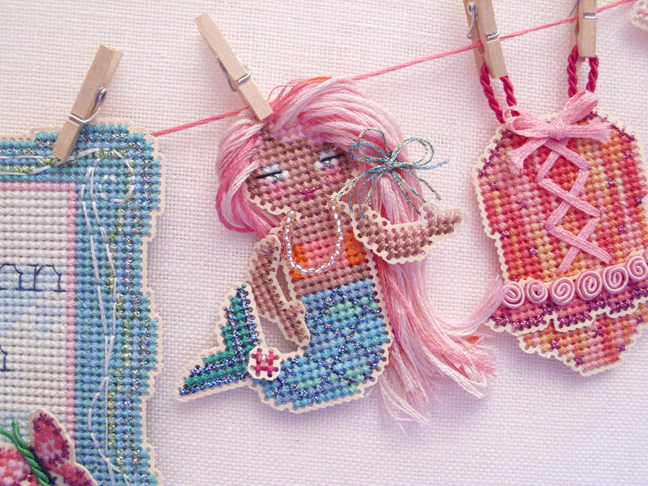 The final framing dimensions will vary depending on how the stitched charms are arranged on the clothes line. 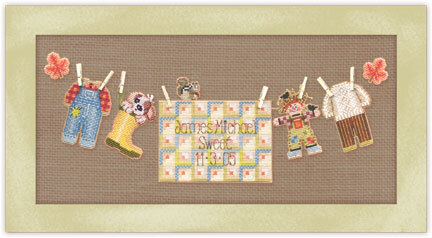 Includes: 14 count brown perforated Paper, glass seed beads, tapestry and beading needles, miniature clothespins, Velcro® pieces and charted design with alphabet and complete finishing instructions. 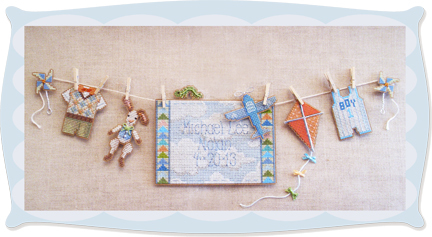 The pieces are individually stitched & beaded on perforated paper and mounted on the background of your choice with Velcro® and miniature clothespins. Inside frame dimensions are approximately 17" x 9". 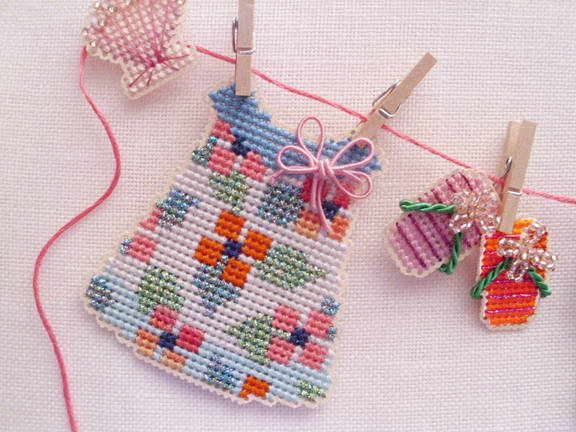 The final framing dimensions will vary depending on how the stitched charms are arranged on the clothes line. 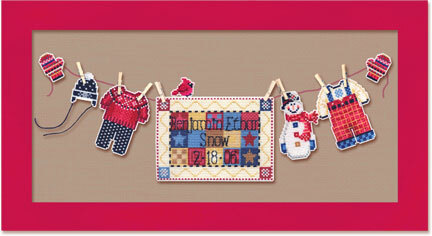 Includes: 14 count white perforated Paper, Mill Hill® beads, tapestry and beading needles, miniature clothespins, Velcro® and charted design with alphabet and complete finishing instructions. The pieces are individually stitched on perforated paper and mounted on the background of your choice with Velcro® and miniature clothespins. Inside frame dimensions are approximately 16" x 8". The final framing dimensions will vary depending on how far apart the stitched pieces are spaced on the line. 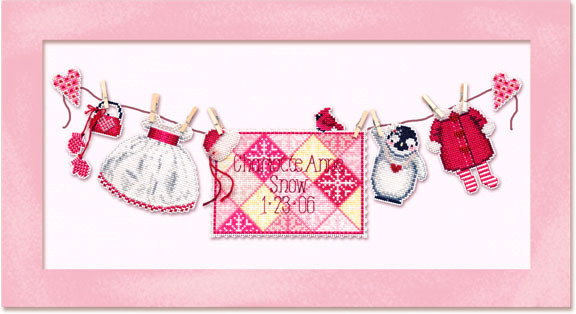 Includes: 14 count white perforated Paper, glass seed beads, tapestry and beading needles, miniature clothespins, Velcro® pieces and charted design with alphabet and complete finishing instructions. Includes: 14 count Ecru perforated paper, glass seed beads, beading needle, miniature clothespins and charted design with alphabet and complete finishing instructions.